The Emerson Food Cam is located in the lobby of Piano Row. 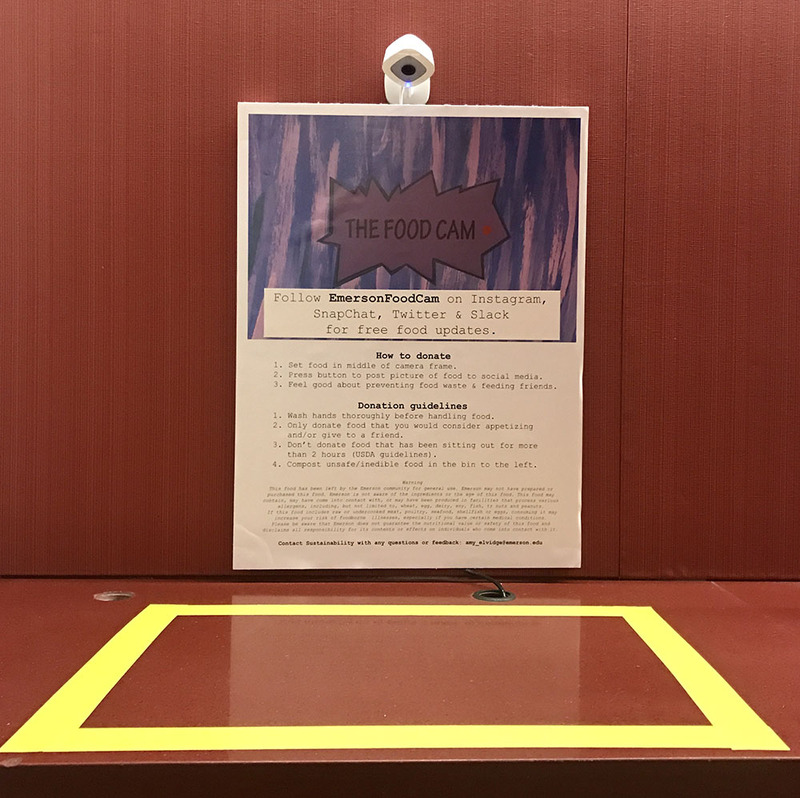 Sustainability Coordinator Amy Elvidge’s newest solution to food waste on campus is a community space where students can send photos of small quantities of extra food for the Emerson community to claim, called the Emerson Food Cam. With the press of a button attached to the wall, a camera placed above the monitored counter in the Piano Row lobby sends a picture of the food to the community via Instagram, Twitter, Snapchat, and Slack. This program began on Monday, but the Office of Sustainability also runs a program to donate larger quantities of food to St. Francis House. Elvidge said since February 2016, the college has donated over 2,000 pounds to the nonprofit daytime shelter. The Food Cam is for smaller quantities of cookies, pita chips and hummus, vegetable platters, and other items that are left unattended near the Piano Row check in desk, Elvidge said. Elvidge said these snacks often end up in the trash because students don’t know how long the food has been sitting out. The Food Cam is a space to consolidate these items and make sure that anything left after half an hour is composted. Elvidge said she worked with the college’s legal counsel on writing the disclaimer that hangs underneath the camera, outlining the potential health and safety hazards to participating in the Food Cam. “We trust that people won’t use the Food Cam to cause harm,” Elvidge said. Elvidge said she selected the Campus Center for the program because many smaller meetings and events are held in the Charles Beard Room, which moved to Piano Row this year due to the construction of the Little Building, and the Multipurpose Room. The area also has heavy foot traffic and is accessible to all students. The Food Cam is available to use Monday to Friday from 10 a.m to 11 p.m. and will be cleaned every night, Elvidge said. Only 27 percent of the college’s waste is diverted from going into landfills, Elvidge said. She said she’s trying to increase this rate with a few new initiatives, like purchasing hand dryers in the most used bathrooms and introducing recycling into college theaters. Elvidge said the college is committed to reaching carbon neutrality by 2030 and food waste produces emissions. Eco-Rep Carrie Cullen said she helped run the Weigh the Waste education program in the dining hall last semester. The junior visual and media arts major said the trash and recycling bins were replaced with translucent buckets to be weighed every hour. In just 60 minutes, students produced 30 pounds of edible food waste, she said. This number excludes napkins, fruit skin, bones, and other items that cannot be consumed. Cullen said she believes the college waste problem is because students are detached from the choices they make and whether or not they’re sustainable. “We’re so surrounded by big portions as Americans, I don’t think we really put two and two together,” Cullen said. Cullen said although food waste is contributing to climate change, it is not just an environmental issue. Elvidge said a Vox video called “Food waste is the world’s dumbest problem” introduced her to the Massachusetts Institute of Technology Media Lab FoodCam, created by Will Glesnes and Jon Ferguson while working at the lab in 1999. Glesnes said students’ desire to experiment with new technology sparked the success of the MIT FoodCam. “There’s no doubt that [the food cam] has dramatically cut down on food waste,” Ferguson said. Glesnes is a network and security engineer at the Media Lab and Ferguson has moved on to robot skills engineering at Jibo, a startup developing a robot for the home, but they both said this “happy accident” has been their longest ever project. Other colleges have contacted Glesnes about starting a food cam of their own, but he said Emerson is the only school that let him know they started the program. “As a person who cares about waste, I think it’s important and wonderful that other people are implementing this in an effort to not waste food,” Glesnes said.